GhoSt Augustine gives guests the opportunity to tour the darker side of St. Augustine's history. Founded in 2001 as the ancient city’s first paranormal store to sell professional ghost-hunting equipment, GhoSt Augustine offers believers and skeptics alike the chance to embark on a ghostly adventure on one of their guided tours. All the tours offered by GhoSt Augustine are led by knowledgeable guides and include visits to authentic haunted locations throughout the nation's oldest city. These non-theatrical ghost tours take guests deep into St. Augustine’s haunted history. There are two options for guests aboard the Everdark Express. Option One is the Everdark Express Shadow Shuttle Ghost Tour. 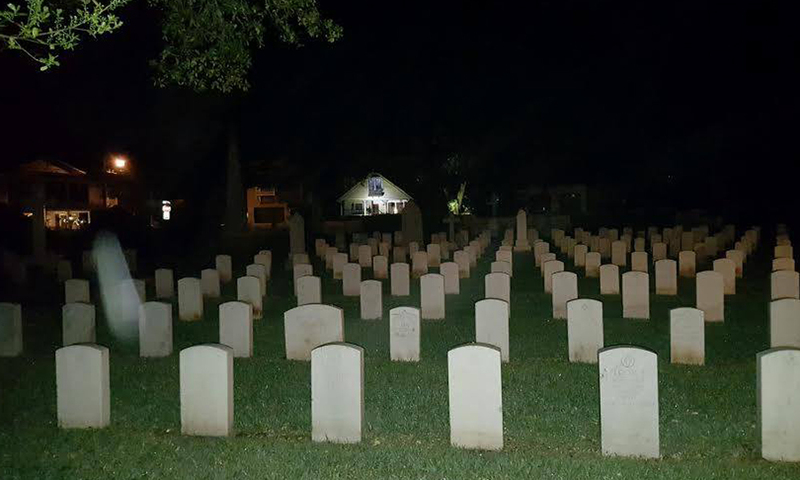 Guests ride on a passenger van made for sightseeing (maximum 14 people) with stops at various haunted locations, such as the St. Augustine Lighthouse grounds, as well as a cemetery or two, offering glimpses at one cemetery that's off the beaten path. The tour includes the use of a K2 EMF ghost meter as well as other specialized ghost-hunting equipment. Option Two is the Everdark Express Original Hearse Ride Ghost Tour, which allows guests to go inside one haunted building and visit the grounds of the Castillo, along with stops at the St. Francis Inn and the National Cemetery, with more haunted stops along the way, as time permits. This tour is for a maximum of 9 people, and includes the use of a K2 EMF ghost meter. St. Augustine’s Original Haunted Pub Tour is a nightly adventure into the world of spirits (both kinds!) led by ghost/pub tour guides from GhoSt Augustine. Established in 2002, this is the original haunted pub tour in the nation’s oldest city. The tour is led by a ghost/pub guide, and take guests to three or four haunted bars. If one prefers to ride, one can do so on the Pub Hearse Ride - in a haunted hearse! At each location, the guide spins the haunted tales and usually touches on some of St. Augustine’s history in general. Guests have the opportunity to get a drink at each location, and the tour guide brings a K2 EMF ghost meter into each pub to check for anomalies. Each night is a unique adventure on the Original Haunted Pub Tour and guests always end the tour in great spirits after having cheered with fellow tour guests and the regulars of the past at the haunted pubs of St. Augustine. The Original Haunted Pub Tour includes an optional pre-tour visit inside a very haunted building, a one-of-a-kind souvenir, and a coupon for 10% off at Beerhammer’s Beer Gear. Tours depart at 8:30 p.m. and usually last until 11 p.m. The optional pre-tour visit to a famously haunted building begins at 7:30 p.m. On Fridays and Saturdays, GhoSt Augustine offers additional departure times, strictly for those over age 21. GhoSt Augustine also offers riding and walking ghost tours, paranormal investigations, private tours, and group discount for 12 people of more. Call (904) 824-8840 or visit here for more information and to reserve a spot on the tour. A stroll down lover’s lane featuring historic tales of love and romance which often end tragically, and with ghostly consequences. The tour covers primarily the romantic romantic beautiful backstreets of the eerie, romantic, quiet, still and haunted south end of historic St. Augustine’s oldest neighborhoods. This tour transports participants via hearse to three haunted bars in the historic downtown area. Drinks are not included in this package, but are available. Tour takes approximately three hours to complete and guide has a K2 EMF ghost meter on hand. Minimum age for this tour is 21 and it is limited to 8 people, so reservations are suggested. A walking ghost tour in the downtown area, the Dead Walk includes a visit to a very haunted building that was featured on TV’s “My Ghost Story.” A knowledgeable ghost-hunting guide takes guests through the dark, narrow streets that are inaccessible to tour vehicles. Guests are given access to a K2 EMF ghost meter to assist in ghost hunting. Cameras are recommended. Tours can accommodate up to 25 people. This tour gives guests an opportunity to become paranormal field investigators for the night. Guests will use equipment and learn how to tune into the paranormal and have the opportunity to decide for themselves if the St. Augustine truly is haunted or not. Tales of past paranormal encounters at these sites, as well as relevant historic details, will be shared. The tour is not designed to frighten guests, but to educate them in the investigation of haunted phenomena. Part riding and part walking, this four or more hours experience takes a maximum of 14 guests through the entire historic district and beyond. Half of the tour is investigation, and for the remainder of the tour, guests will ride in the passenger van listening to the true stories of unique haunted sites, as well as limited investigation sessions. Halfway through this tour, there is an intermission for refreshments and rest. Please call (904) 824-8840, or visit here, to book a tour. Scared the bajeebees outta me! 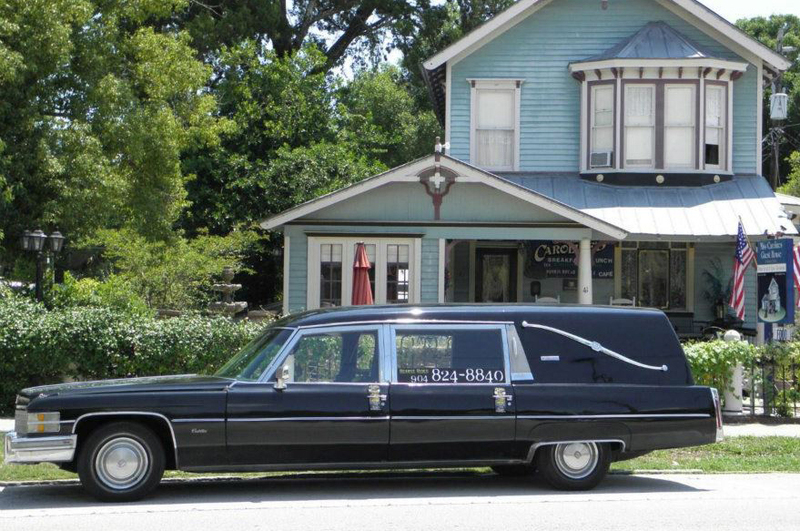 Didn't count on an actual ride in a hearse... This town is pretty spooky in spots at night. In a hearse? You can fill in the blanks yourself.